This inspiring invention by the Turkish robotics company AMS Mekatronic offers something wonderful to our paraplegic friends everywhere. This SegWay scooter like offering is called the Robotic Mobilization Device and provides an astonishing range of motion that could never be achieved in a wheelchair. 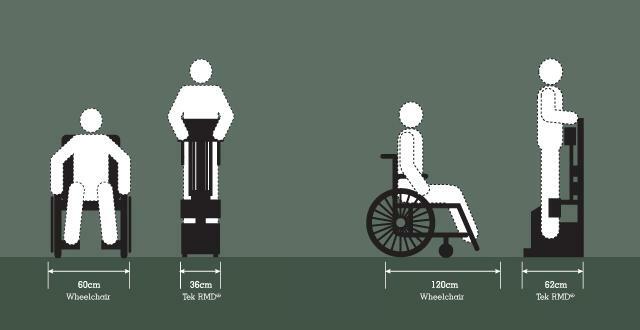 People without the use of their legs will now be able to stand and move around in any direction. Making such tasks as cooking, shopping, general interactions with others, and even getting out of bed easier and done autonomously. The device's compact dimensions allow users to easily access areas that were once impossible to get to. The user can adjust the RMD's height to always be at eye level of others. According to Gizmodo it was just released in Turkey with a $15,000 price tag. We hope to see it everywhere soon. Wheelchairs are used by people walking is difficult or impossible due to illness, injury or disability.